Shelf Life 1 years from date of manufactured. 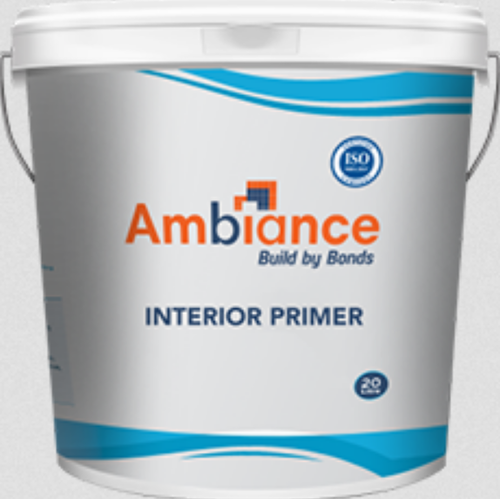 Product Code AIP - Ambiance Interior Primer. AMBIANCE INTERIOR PRIMER is water thinnable primer. It is suitable for Interior plastered walls, asbestos, cement concrete etc. as a primer coat. The product is made from fine inorganic fillers, Additives, Polymers, etc. This product can be used as a primer prior to any water based paint application. is high then Cure the plaster with water. Remove dust particles and loose plaster with sand paper. If the plaster has already coated with lime wash, paint, etc. must be scrapped. For best results fill the porous & cavities with putty in the plaster. If required full putty coat can also be done on the entire plaster. Apply a coat of primer and leave it for 6 hours drying before painting.